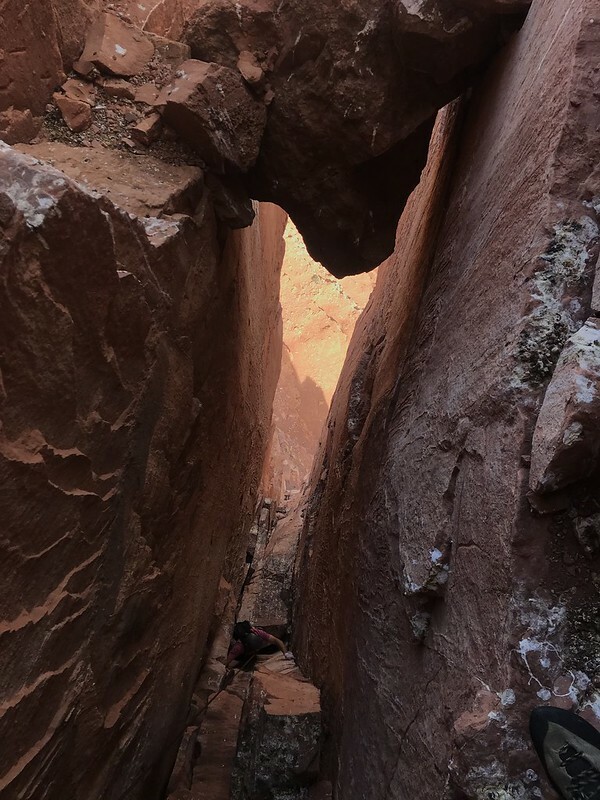 After driving half the day on Friday and most of the day on Saturday Ben and I got into Moab Saturday afternoon and went to climb Wall Street before it got dark. 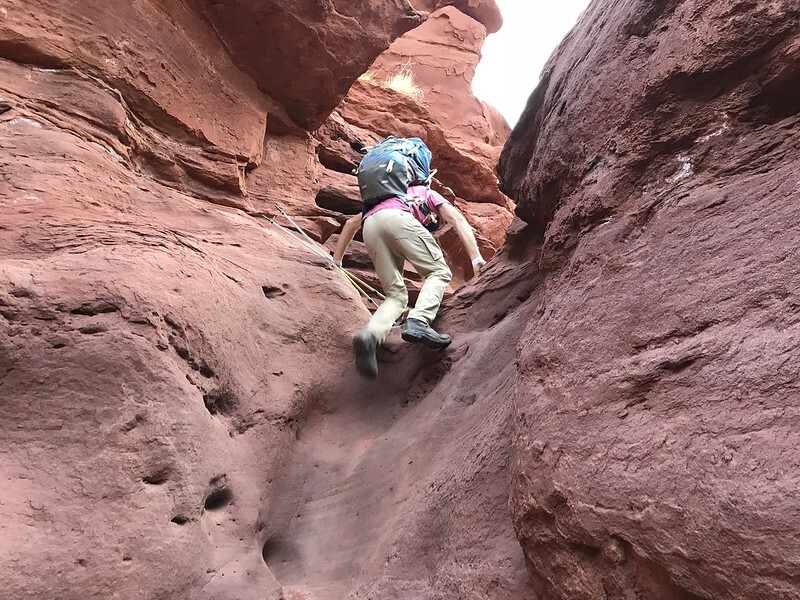 Climbing the sandstone of southern Utah is as similar to the granite of Washington as geography between the regions is. Crack climbing technique doesn’t change much, but unfortunately I have none of it. No matter though, we’re all warmed up now so we drove out to Castle Valley to camp at the trail head. This was our big objective for the trip. Best to get it out of the way early so we can do other things. 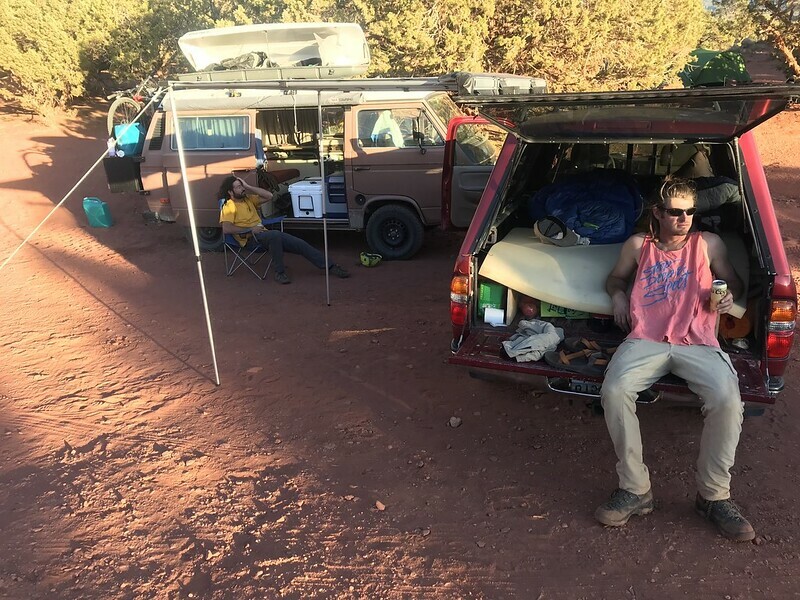 The third member of our team had a days head start on us but the Westfalia is actually a two day handicap so he rolled in to camp later that night. We all got up the next morning at 6am and beat the other potential climbers out of camp by 730am. The trail heads straight up the wash from the parking lot following the cairns. Eventually it runs into a road and turns left to follow it before crossing and continuing on to the base of the tower. It took us a little over and hour from the car to gain the saddle just below the tower. The base of the route was easy to identify because there was a team already there ahead of us. They would have served as a convenient point of reference except that they were tragically slow which meant that it was a little after 10 when we finally started climbing. The first pitch follows a great sustained hand crack up a corner. The crux of the route is a bulge at the top to pull through to reach the first belay. This was a little tight for three people. The seconds pitch starts with a short off width section. A 5 or 6 camalot would be usefulhere but we didn’t have one. “The bolt” seems decent enough to hang on but I wouldn’t feel great about falling on it. Climbing the chimney alternates between easy climbing and pulling several committing moves. The belay uses two large pitons fixed in the rock. The last two pitches can be link together if you mind the rope drag. We did not. Climb up and left out of the chimney then step over and across it to the far side and climb up to the notch. Climb through it and meet up with the last pitch of Kor-Ingalls. The wind was ripping pretty hard when we topped out a little after 2pm. The other group was nowhere to be seen so we hung around on top for awhile enjoying ourselves and the wind. When we couldnt take it any more we started our way down. Rappel the North Face for the most direct way back. This takes 3 double rope rappels with a 6o meter rope. Then we were back on the ground. 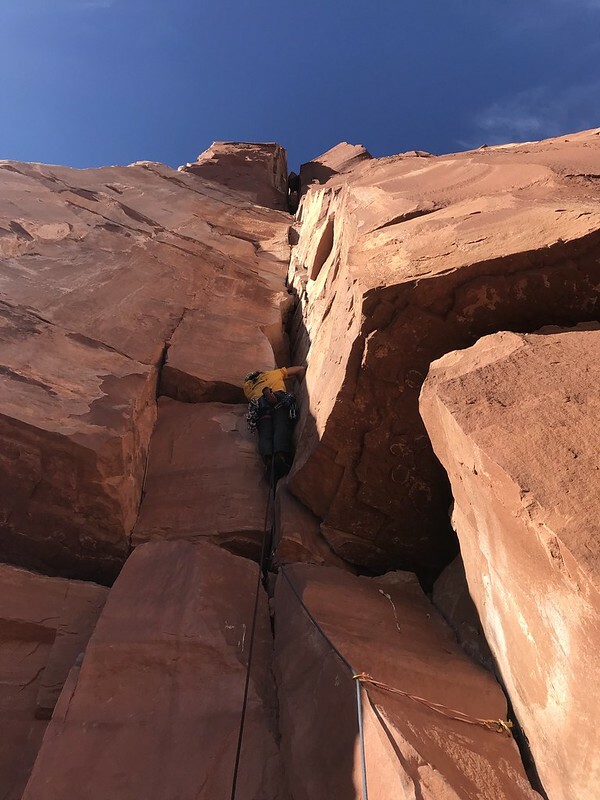 Tagged Climbing, Castleton Tower, North Chimney, Utah, Moab, Castle Valley.